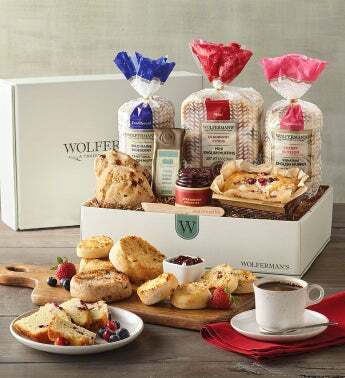 Year-in and year-out, the Berry Breakfast Box is one of our most popular gift selections. Delight in the sweet and tart flavors in our extra-delicious English muffins, provided here in all three sizes, and spread on our fruit preserves with our signature wooden spreader to kick things up a notch. The fruity flavors continue with a moist cranberry orange loaf cake and other indulgent treats. These bakery goodies are perfect for enjoying any time of day.